In her brief life, Emily Bronte created a novel with characters so unforgettable that we still talk about them—and some of us obsess over them—nearly two hundred years later. From the passionate-to-a-fault Cathy and Heathcliff, to the uppity Edgar and Isabella Linton, to the viciously cray-cray Hindley, the inhabitants of Wuthering Heights and the neighboring Thrushcross Grange are so very complex that it seems impossible to believe they’re fictional and not living, breathing people of the world. (Though, practically speaking, it’s probably a good thing that they do only live on the page. I definitely wouldn’t want to find any of them moving in next door. Drama!) In honor of Miss Bronte’s birthday today, I’m bestowing the title of Literary Hunk of July on the guy who steals my heart more and more every time I pick up Wuthering Heights, a guy who is often overlooked and desperately in need of a hug, the one and only Hareton Earnshaw. When people discuss Wuthering Heights, the topic almost always centers around Heathcliff and Cathy, but there is so much more going on in this novel—namely, the bonny lad Heathcliff is determined to turn as crooked as himself. (Spoiler alert, Heathcliff. Hareton can’t be broken that easily!) Stripped of his birthright and treated no better than a flea-infested rodent, Hareton could grow up cold and resentful and mean like some people (ahem! Heathcliff…), but he doesn’t. Yes, he’s a little rough around the edges, and yes, his table manners leave something to be desired, but he’s got a generous spirit and a heart of pure gold. He even loves Heathcliff, which is kind of sweet because no one loves Heathcliff. Hareton may be a man of few words, but his gestures show all of the mettle and good-heartedness lying under that sullen exterior. He was never taught to read, so he makes it a mission to teach himself. And sure, it’s partly because his cousin/mega-crush Catherine laughs at him, and partly to impress her, but also partly because he just wants to learn how to read! (Seriously, can someone please give this boy a hug?) And when he does take it upon himself to learn to read, he sneaks away with not just any old books, but Catherine’s favorite books. Smooth move, Romeo. I like your style. It’s not just his desire to read that steals my heart (although there is something a little Jordan Catalano-ish about it that will always make me swoon), but there’s also the way he digs up a row of lame bushes and replaces them with Catherine’s favorite flowers to remind her of Thrushcross Grange. And he stands up to Heathcliff over it, which is huge. I mean, he sort of stands up to Heathcliff over it. He does, but he also tells Catherine that he won’t let her speak ill of him, because in a sad, sick way, Heathcliff if the only person who has ever shown him any love, even though Heathcliff has robbed him of, like, everything he should have in life. It’s all pretty tormented and messy, but the bottom line is, Hareton is strong in his loyalties and diplomatic when those loyalties are at odds with one another. He’d actually make a pretty decent politician. You know, if he were real and could work on those table manners. 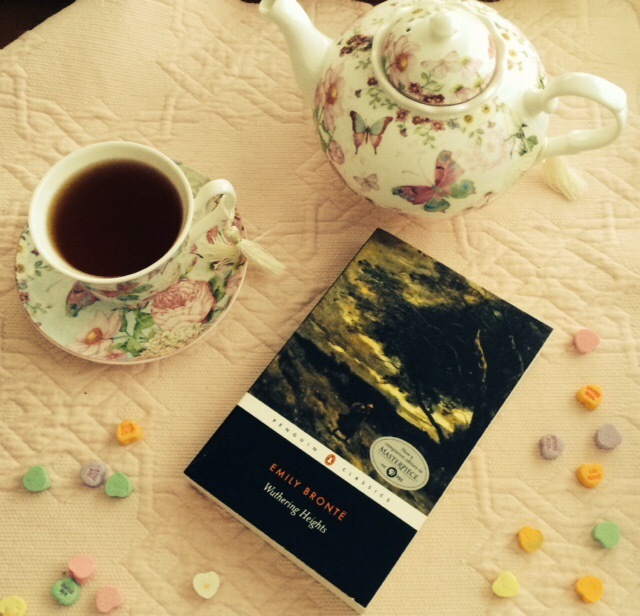 So yes, Wuthering Heights will always be synonymous with Cathy and Heathcliff and their eternally combined souls, but let’s not forget that in this dark and haunted story of jealousy, greed, and revenge, there’s also that shining golden heart of purity and love that gives us our hopeful ending. This one’s for you, Hareton Earnshaw. Keep keepin’ on, never forget that the surest way to a lady’s heart is through her books. Want to cuddle up and watch Hareton in action? My personal favorite adaptation is the 2009 BBC version with Andrew Hawley as Hareton, Charlotte Riley as Cathy, and, oh yeah, TOM HARDY as Heathcliff. There are a lot of Wuthering Heights films out there, but this is the only one I’ve seen that covers the breadth of the story from Cathy and Heathcliff to Catherine and Hareton. Thank you so much!! It is definitely a book that stays with you!! This makes me want to re-read Wuthering Heights! I have to admit, I was always so horrified (and dazzled) by Cathy and Heathcliff that I always saw Hareton as a sort of non-entity. You’ve turned me around! I know, how can you not be swept away by Cathy and Heathcliff? But Hareton has my heart!